On September 29th Asko Vuori, from Finland, announced his factorof a Fermat number: 6213186413.2^605+1 divides F600! Arno used version 4.4 of Leonid Durman's Fermat.exe program for his search. It is the first Fm with a multiple of 100, for which a factor is discovered. Here is a snapshot, http://www.fermatsearch.org/images/vuori600.jpg , of the desktop. This factor also solves issue 4 presented here, http://primepuzzles.net/puzzles/puzz_149.htm , from Alberto Hernández from Monterey, Mexico. Note from Jwb52z: If anyone reading this knows the code for superscript and subscript that will work on this board, please post it somewhere and identify it. I hate not having a way to indicate subscript at all as in "F600" when the 600 is subscript. Maximilian Pacher Strikes again! Maxi found the second Fermat factor of 2008! "When I sent you my last Fermat-Factor of F1710. And you have written "a third factor could be near the corner". Now, one month later, I am of the opinion, that it is time to recover a new factor: 364182745 . 21724+1 is a Factor of F1722!!!! I am very happy, that I have found this factor so shortly after my last one. This is my third Fermat-factor an the second in this year if I remember correctly. I used "NewPGen", "PRP" and "WinPFGW". Congratulations again, Maximilian! Now we're waiting for the third! Maximilian Pacher found the first Fermat factor of 2008! "After 7 years of searching, I'm very happy to announce my second Fermat factor: 351276975 . 21719+1 divides F1710! I have been searching for Fermat-factors since 2001 and this factor is my second one (my first one is 2018719057*21162+1, that is a factor of F(1160)). I hope, it will not be the last one." Maxi found this factor using "NewPGen", "PRP" and "WinPFGW" programs. The site has been successfully transferred. Enjoy it! I am changing the domain maintainer, so expect some outages in the next days. Souichi Murata found a new factor: 485 . 2 338297+1 divides F338295! Reto Keiser found a new factor: 243 . 2 495732+1 divides F495728! Curtis Cooper found a new factor: 7 . 2 2167800+1 divides F2167797! Pavlos Saridis found a new factor: 151 . 2 585044+1 divides F585042! 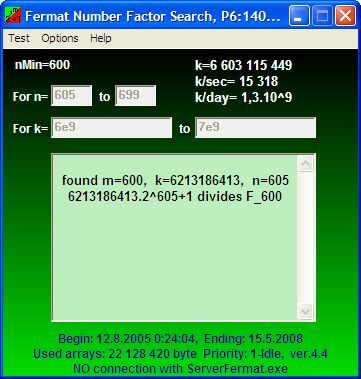 It is the opening discovery of 2007, the 5th greatest known prime divisor of a Fermat number, the greatest Fermat divisor with 3 digit k.
As we know Pavlos has been searching for more than 8 years. Very nice Job, Pavlos. Asko Vuori found a new factor: 121531 . 2 30260+1 divides F30256! Jun Tajima found a new factor: 1207 . 2 410108+1 divides F410105! Wonderful news from Takahiro Nohara, who found the third Fermat factor of 2008! "I found a new prime factor of the Fermat number today. (3rd May): 28949 . 2^48627+1 is a Factor of F48624. I used FermFact.exe, LLR.exe and PFGW.exe to search this number. This is 3rd factor of Fermat number found by me and it has took close to five years since previuos report.". Caution about WinPFGW usage for Fermat factor searching. In WInPFGW there is a risk to miss a Fermat factor. For example, if you command as follows to calculate Fermat (or Generalized Fermat) numbers divisibility. As you know, 9*2^461081+1 is a factor of F461076. But you will not get this result with winPFGW. This is probably caused by a error of FFT calculation in this software. To get a correct result, use -a1 or -a2 switches. -a1 command means use larger size of FFT than standard one. Needless to say, it takes longer calculation time than normal also. So far, I've faced at least other 4 examples like this. It is enough risky! -a2 is much safer, so type -a2 is recommended. But I think -a1 is enough in normal usage. A new instrument to search for Fermat factors has been released. GMP-Fermat, the creation of Mark Rodenkirch (aka rogue) is now available for all platforms. The source code may be compiled on DOS, Linux and Windows, as well as PowerPC, Sparc and all the architectures where GMP library can be installed. Geoffrey Reynolds provided its superfast assembly routines for modular multiplication and we may now download, http://www.fermatsearch.org/download.html , a 64-bit version compiled under Linux, faster than Fermat.exe for n>45. A wonderful gift for researchers, offered by our collaborative effort. Payam Samidoost found the fourth Fermat number factor of the year! 6089*2^79223+1 is a Factor of F79221!!! "The sieve was done by Fougeron's FermFact up to 3T. It was found prime using Penne's LLRNET running over 30 clients. [07/31/08 22:46:50] 6089*2^79223+1 is prime! Finally Fougeron's pfgw revealed the Fermat divisiblity one night later. Unfortunately PFGW does not log the exact time." After the two Mersenne primes discovered between August and September, we have a new Fermat factor! Martin Ptáček from Czech Republic found the fifth Fermat factor of 2008: 3334131633063 . 2^101+1 is a Factor of F96!!!. Martin found the factor using an AMD sempron LE-1200 2,1GHz and 2GB ram and Fermat.exe program. Your webmaster is back online, and the pending ranges have been updated. Thank to your cumulative effort, all the holes below N=250 have been filled. We are approaching 1000 CPU years of Pentium II/400 ! 177795 * 2^38969+1 is a Factor of F38967!!!. Takahiro found the factor and two new xGF factors too. Congratulations go to Takahiro Nohara! Geoffrey Reynolds recoded part of his assembly routines in Mark Rodenkirch's program up to 768 bit, and released binaries of GMP-Factor for both Linux 32 bit and Linux 64 bit platforms! FermatSearch passed 1000 CPU years of Pentium II/400 ! Thanks to all the researchers that joined the project! Congratulations to Eric Ueda, the discoverer of PrimeGrid's first Fermat divisor in the Proth Prime Search project: 651 * 2^476632+1 is a Factor of F476624!!!. It is only the 6th found Fermat divisor of 2008 and 270th overall. The prime is 143,484 digits long and is the 8th largest Fermat divisor in Chris Caldwell's “The Largest Known Primes Database”. The discovery was made by Eric Ueda of the United States using an Intel C2Q Q6600 @ 2.40 GHz with 1 GB RAM. This computer took almost 4 minutes 43 seconds to test. Eric is a member of TeAm AnandTech. Congratulations to Senji ****, the discoverer of PrimeGrid's second Fermat divisor in the Proth Prime Search project: 519 * 2^567235+1 is a Factor of F567233!!!. It is only the 2nd found Fermat divisor of 2009 and 272nd overall. The prime is 170,758 digits long and is the 7th largest Fermat Number divisor in Chris Caldwell's “The Largest Known Primes Database” http://primes.utm.edu/primes . The discovery was made by Senji **** (s-yama) of the Japan using an Intel C2Q Q9450 @ 2.66GHz with 2 GB RAM. This computer took about 8 minutes to test. Senji is a member of team Tamagawa Data Center. Congratulations to Eric Embling, the discoverer of PrimeGrid's, http://www.primegrid.com/ , third Fermat divisor in the Proth Prime Search project: 659 * 2^617815+1 is a Factor of F617813!!!. It is the 3rd found Fermat divisor of 2009 and 273nd overall. The prime is 185,984 digits long and is the 6th largest Fermat Number divisor in Chris Caldwell's “The Largest Known Primes Database”, http://primes.utm.edu/primes . Incidentally, it is a new record for "weighted" Fermat Number divisors. The discovery was made by Eric Embling (Eric E) of the United States using an Intel C2D E6750 @ 2.66GHz with 4 GB RAM. This computer took about 8 minutes 31 seconds to test. Eric is a member of team [H]ard|OCP. 4. LLR, primality program developed by Jean Penné. 71007*249490+1 is a Factor of F49488!!!. Takahiro found the factor and two new xGF factors too, using Fermfact for sienving, LLR for Proth tests and OpenPFGW for checking xGFN divisibily test. PFGW 1.3 for Windows is out!!!. Mark Rodenkirch did the magic, and re-engineered PFGW with George Woltman's GWNUM 25.10 library. George Wolrman announced today that a new factor of F19 has been found: 37590055514133754286524446080499713 is a Factor of F19!!!. The factor has been discovered by user Buckle using Prime95, while testing some ECM curves on F19. It's the first factor of a Fermat number of index < 30 since the turn of the century, and only the fourth of index < 80. The 35 digits factor has been proven prime, a 157,770-digit composite cofactor remains. The cofactor has been proven composite by independent users, with different software. The known factorization of F19 is now 70525124609.646730219521.37590055514133754286524446080499713.C157770 Congratulations to GIMPS distributed ECM effort! Mark Rodenkirch released a new, enhanced and bug-free version of PFGW for Windows, Linux and MAC, based on v25.13 of gwnum library. The new executable can be found on the Download, http://www.fermatsearch.org/download.html , page. Thank you Mark! Takahiro Nohara found a new Fermat factor: 1814649*2^12827+1 is a Factor of F12825!!!. "After six month since my previous report of a factor of the Fermat number, I'm able to tell you following one. I also accumulated dozens of xGFN factors since my previous report. pfgw.exe to test xGFN divisibility (with -a2 or -a1 switch)"
Congratulations to Mr. Takahiro Nohara! GIMPS strikes again! Tapio Rajala (Department of Mathematics and Statistics - University of Jyväskylä, Finland) found a new Fermat factor: 1784180997819127957596374417642156545110881094717 * 2^16+1 is a Factor of F14!!!. Sergei Maiorov found a new Fermat factor: 84977118993 * 2^520+1 is a Factor of F517!! !.